A budget surplus is a rare financial state where a government’s income exceeds its expenses. This term may also be used in relation to an individual or business’s financial state, even though the terms savings for the former and free cash flow for the latter may be more appropriate. We will discuss budget surplus as a macroeconomic term in this article. Governments usually operate within a fiscal year in which, at the beginning, they must present a financial plan detailing proposed revenues and spending. A budget surplus occurs when the proposed revenues are more than the anticipated expenditures. Budget surplus = Government’s total income – Government’s total expenditure. A primary budget surplus happens when interest payments on outstanding debt are not included in the government’s total expenditure. For example, a government with a budget deficit of $24 billion but paying $30 billion as interest on outstanding debt can be said to have a primary budget surplus of $6 billion. A government operating on a primary budget surplus but struggling through austerity can decide to default and instead channel the extra funds to infrastructure development. Austerity is an economic condition where the government is forced to cut public spending and increase taxes to meet national debt payments. Most debt-laden countries in the Eurozone area, including Greece, have been experiencing primary budget surplus frequently, hence the proposition that it is best for them to default and exit the E.U. Since the year 2000, the U.S. government has only achieved annual budget surpluses twice. 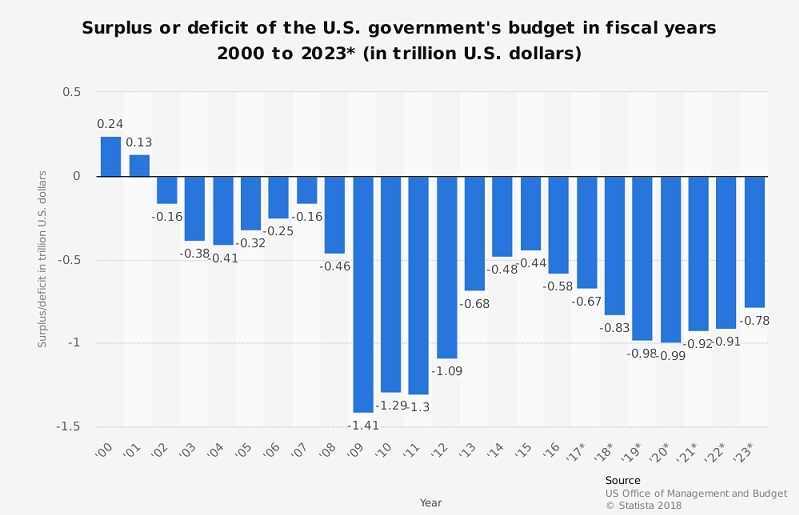 The two budget surpluses came during Bill Clinton’s presidency, mostly as a result of massive tax increases on the high-income bracket and reduced government spending on defense. While a budget surplus mostly signifies a healthy economy, a lack of one does not signify that the economy is performing poorly. An economy can still be healthy even when the government’s spending is more than its revenues. This is possible in developing economies where rapid infrastructure investment is needed to boost the economy. When a budget surplus is achieved, a government can decide to cut taxes or use the extra proceeds to clear outstanding national debt. Debt settlement is good for the economy since it reduces expenses in terms of interest payments. The government can also decide to use the surplus amount to fund infrastructure, start new projects, or save for future financial difficulties. Tax cuts as a result of a budget surplus can also be very beneficial to an economy. This is because when taxes are low, people have more disposable income and, consequently, high spending power. Spending encourages production and, as a result, creates more jobs for the people. A budget surplus gives an economy more flexibility during times of economic difficulties. Governments can use the extra cash to stimulate the economy in times of recession rather than depend on debt. Again, having a budget surplus enables a country to clear off its debts and therefore save on interest payments. Likewise, a government with a primary budget surplus has an option to default on a loan as it reorganizes its finances temporarily. With a budget deficit, governments are tied to the debt since they cannot operate without it. Another advantage of running on a budget surplus is that it paints a good picture of a country, therefore attracting investment. Governments with a history of operating on budget surpluses are more likely to secure loans with better terms than those always operating on budget deficits. A budget surplus resulting from an unnecessary increase in taxes can do more harm to an economy than good. When taxes are high, people’s spending power declines and, as a result, the demand and supply for goods decline. This can lead to a recession since employment creation and wages rise to depend very much on demand and supply. Governments must, therefore, review their tax policies regularly to determine if the surpluses are a result of a cash-starved private sector. Budget surplus should result in tax cuts where the private sector purchasing power is deemed to be low. A government can experience a budget surplus due to accumulations of Medicare trust funds and pension reserves. In fact, studies show that at least 50% of budget surpluses are because of these accumulations. One instance when this scenario is possible is when the number of people entering the job market far exceeds the number retiring. The surplus is temporary and is likely to be offset when these funds are claimed. With governments across the world struggling to meet the ever-rising social security, pension, and health insurance needs, the most prudent thing to do is to save the surplus amount for the future. A government may experience a budget surplus in a given year, but there is a high likelihood that it will experience deficits in the coming years. However, this argument is debatable, given that tax cuts have the potential to boost economic growth and increase government revenues. 1. What is a primary budget surplus? A. Government’s total revenues less total spending. B. Government’s total revenues less interest payments from debt. C. Government’s total revenues plus interest payments less debt. D. Government’s total revenues less total spending minus interest payments. 2. Which of the following is not an advantage of a budget surplus? A. Gives an economy more flexibility during economic recessions. B. Paints a good picture of a country to creditors. C. Helps a country reduce its debt burden. 3. When is a budget surplus a bad sign? A. During an economic boom. B. When the private sector is cash-starved. C. When there is a lot of money in circulation in the economy.